Inder Loves Folk Art: Ice Cream Top for Maggie. Whoa. A giant meteor exploded over Russia! That's not something you hear about every day! How is the new job going, you ask? Well, I'm currently negotiating an agreement that has an initial term of fifty years. If it's not perfect, I'm going to hear about it - repeatedly, for the next thirty years or more. But you know, no pressure or anything! Oh right, I made an Ice Cream top for Maggie! It has been a while since I sewed up this pattern. It's so easy and cute! 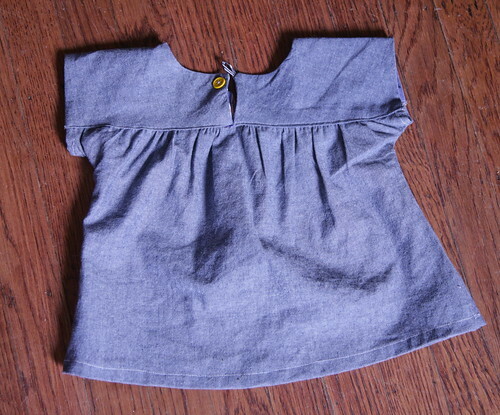 I was inspired by the many adorable solid-color versions of the dress I've been seeing on Flickr and in the blog world, and decided to make a simple chambray version that would go with everything. 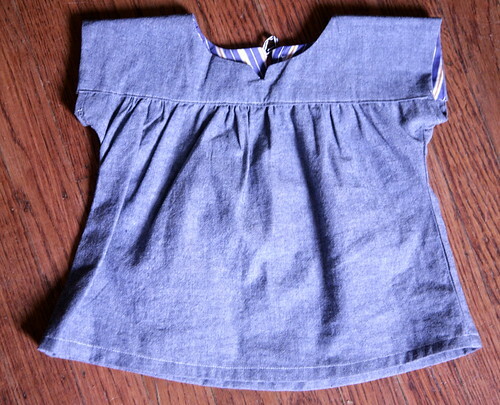 The chambray was a little heavy, so I lined the yoke in a striped shirting fabric to reduce bulk and used a little bit of ribbon for the button loop instead of self-fabric. I decided it needed a little pop of color, so I used a yellow button. It is too chilly to wear it by itself, but it looks so cute over a long sleeved top! 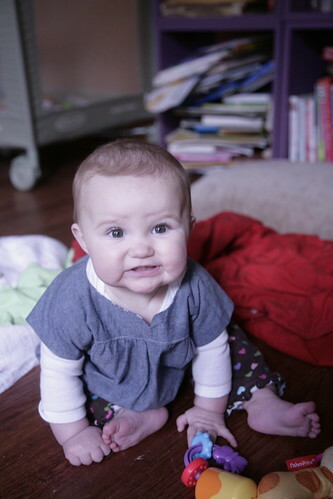 This is the face that Maggie makes when she's done with this activity and she's ready for the next fun thing. I'm reminded of my mother, who always used to tell us kids: "I'm not your entertainment committee!" This baby girl gets bored easily. She does not want to sit in my lap while I, say, write a blog post. Well, not if I'm not going to let her type on the keyboard or knock over my coffee, anyway. No way. She wants to be carried around and shown new things. Is that too much to ask? But even her demanding face is so cute, am I right? 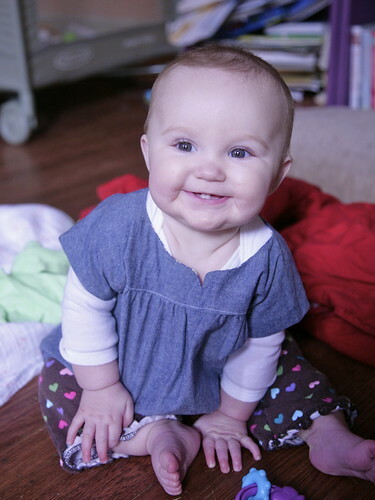 Oh my gosh she is adorable. 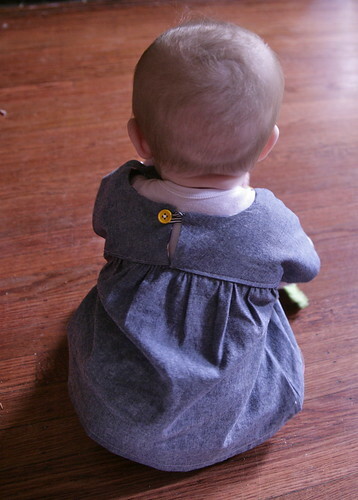 The yellow button is perfect, as is the fabric choice. No pressure on the contract or anything,ha! She's so beautiful! I would totally be her entertainment committee. I'd CHAIR that committee. Sent her my way,plenty of entertainers here! just bought that pattern for both of my girls! I can't wait to try it! By the way - you have to be super mom... work, toddler, sew and blog? My baby screams at the site of the computer and I have to get up at 5 am to sew... sigh I know that this shall pass soon, too soon, but still...I want to make pretty clothes for the girls! Demanding face = a bit hard to refuse :) Love that top in chambray... I love a good cute print as much as the next sewist but I have a growing appreciation of beautiful plain fabric. Sophisticated Maggie!